While this may be 2015, Sweden's Hallas are living in the past, somewhere between 1969 and 1979. 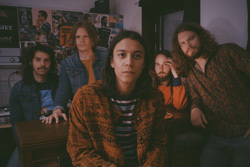 Hallas arrives with their first (that I know) EP, simply self-titled, with four songs. For their sound, they combine retro classic, heavy, and psychedelic rock and then pass it through the New Wave of British Heavy Metal. It's not an unfamiliar sound. Within there's this tripped out feeling to their music, notably from timbre of the guitars. Yet, those same guitars account for much of the harmony, stealing a page from the NWoBHM's twin guitar motif. Then they create additional atmosphere with ethereal and swirling keyboards, once more adding to the space rock motif. There are quiet moments interspersed as well like the light guitar work in latter third of Hallas. Throw in themes of "tyrants, knights, possessing demons and the end of the world" into the lyrics, and you have the twist of sci-fi and fantasy. Again, something not uncommon to the aforementioned period of time. At times the remind me of American band Corsair and their retro progressive space rock, but without female vocals. Overall, it's an interesting, maybe even appealing, musical approach, but one with a limited focus and so a mostly limited audience. Perhaps it was to retro rock for me. I'm not sure. It definitely gave me a relaxed and lazy feeling, putting me in a more passive mode. If you're a stoner, you may want to spin Hallas while your toking on that reefer. 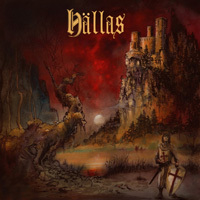 For their sound, Hallas combine retro classic, heavy, and psychedelic rock and then pass it through the New Wave of British Heavy Metal. It definitely gave me a relaxed and lazy feeling, putting me in a more passive mode. If you're a stoner, you may want to spin Hallas while your toking on that reefer.